© Veracruz State Prosecutor's Office, via Associated Press Clothing found at the site of a mass grave in the Mexican state of Veracruz. Mexican authorities said Thursday they found a mass grave with 168 human skulls in Veracruz State, a somber reminder of the tens of thousands of people who have gone missing, presumably at the hands of organized crime members. 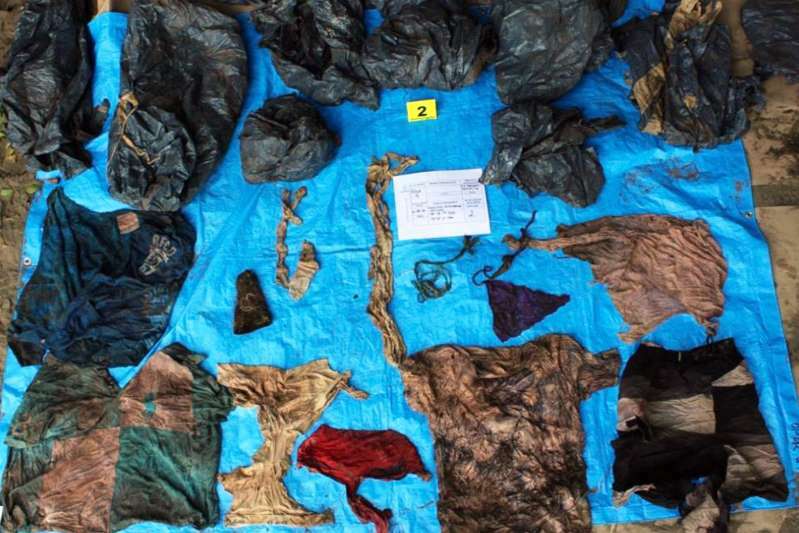 The remains and personal items found at the site, including 200 articles of clothing, suggested that the victims might have been killed two years ago, said Jorge Winckler Ortiz, the Veracruz attorney general. It is one of the biggest clandestine graves found in Mexico in recent years. Veracruz has been one of the states caught up in the horror of these giant dumping grounds, used by drug gangs to dispose of their victims. Federal officials say more than 30,000 people have disappeared in Mexico, although human rights groups put the number much higher. Many families, fearful that the police are working with drug gangs or convinced that investigators will do nothing, never report their missing relatives. Mr. Winckler Ortiz told reporters that a team of investigators found the cemetery on Aug. 8 with the help of drones and ground-penetrating radar. The human remains, along with hundreds of personal items, were buried in 30 spots. Mr. Winkler said investigators were alerted to the grave by a witness, but the authorities kept the discovery a secret for a month for “safety reasons.” Drug gangs have a strong presence in the area. One of the gangs, known as the Zetas, is considered to be among the most brutal in Mexico. The United States government has placed the criminal group at the top of its list of organized crime priorities. Drug gangs have battled over control of territory in Veracruz for years, making it one of the most violent states in the country. A former governor, Javier Duarte, is in jail as he awaits trial on corruption charges. Last year, another mass grave, with 250 human skulls, was discovered on the outskirts of the port city of Veracruz. At the time, Mr. Winckler Ortiz said that they were most likely the victims of drug cartels. That grave was discovered by Colectivo Solecito, a group of mothers looking for their disappeared children. Mr. Winckler Ortiz described the state at the time as a “giant grave” and acknowledged that the authorities did not have the capacity to identify all of the remains found in different dumping grounds. The state will ask for help from Mexico’s federal police to conduct genetic tests of the remains to compare them with DNA samples in databases of missing people, Mr. Winckler Ortiz said.